Headset No. 4 (Auralite 2) and Headset No. 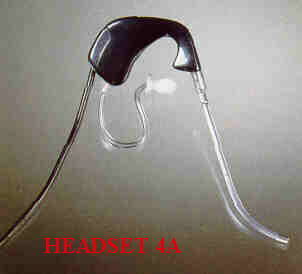 4A (Auralite 2 Executive) are similar in appearance to the Headsets No. 3 and 3A, but use an improved amplifier with a three position switch to control the volume of incoming calls. Superseded on BT by the Headset No. 5 (Auralite Supra), Headset No. 5A (Auralite Supra Executive) and Headset No. 5B (Auralite Supra Executive fitted with a plug 430). Headsets No. 4, 4A, 5, 5A and 5B are only approved for use with systems where the headsets are quoted in the system PXML as an approved attachment. 1. Headset energising current - all headsets 7.5 to 100mA. 2. It was anticipated that about June 1989 a new telephone complete with headset would be introduced.